Don’t get me wrong – I’ve been known to spend a few too many minutes trolling Twitter and Facebook on personal time. You have, too. But when it comes to business, I’m not playing around. I’m not on social media to kill time; I’m there to build a business and find my customers. And the ability to make data-based decisions and assign ROI to social actions is what enables me to do that. I recently waved Goodbye PostRank, Hello Google Social Reports at SmallBizTrends, breaking out five new reports designed to help you keep track of valuable social media insights. Today I want to hone in on three of those reports and show you how to use them to create a delicious, ROI-filled meal. First, let’s be honest. As buzz-y as social media has been over the past few years, it’s also been an elusive beast for marketers trying to track and attribute a hard ROI. Off-site engagement is more difficult to measure than on-site engagement. We don’t immediately know where social media sits in our conversion funnel – top funnel or bottom funnel? We lacked a uniform way to compare activity on different social media sites. We tried to create “new” definitions for ROI instead of focusing on the one metric that trumps all – money. The result was a lot of frustration and wasted dollars when we weren’t sure what was working in social and where our time was best invested. Thankfully, with the new Social reports from Google, we glean a lot more insights. But only if we’re looking in the right areas. 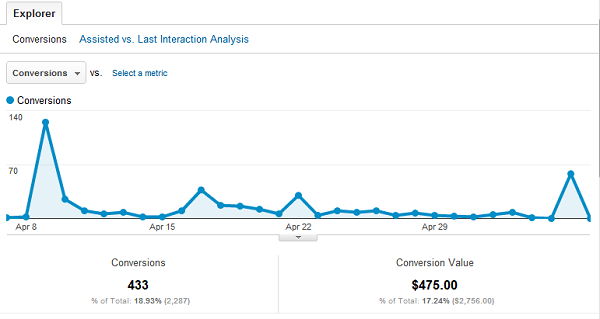 The Overview Report offers you a quick snapshot of where, exactly, on your Web site you’re making money. But to best use it, you must have Goals set up in Google Analytics. If you’re unfamiliar, a Goal is a way to measure business objectives for your Web site. To be valid, it must correspond to a measurable action that visitors on your site will perform. While a conversion is an obvious goal, you also want to focus on micro-goals or the actions that lead to conversions. A micro-goal could be downloading an eBook, signing up for a webinar, or a user viewing five+ pages on your site. When you’re identifying goals, remember that each Goal must contain three things: A business objective, a visitor action, and a measurable success metric. With your Goals set up, you’ll be able to look at this Overview Report and identify where you’re making money. 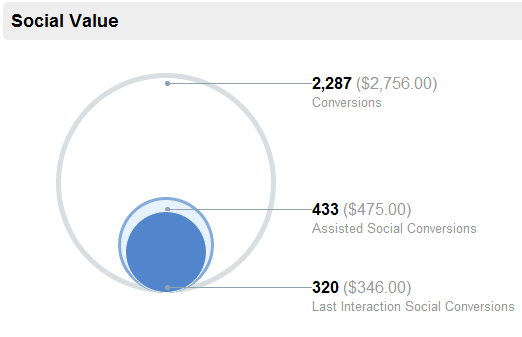 You’ll be able to see the total amount of conversions, plus how many of those conversions were Assisted Social Conversions (top funnel) vs Last Interaction Conversions (bottom funnel). Assisted Conversions [light blue]: When someone visits your site, leaves without converting, but converts later during a subsequent visit. Last Interaction Conversions [dark blue]: When someone visits your site and converts, the visit is considered a last click. This will give insight into whether social is helping to start the conversation about your brand or whether it’s closing the deal. You’ll also be able to see which networks are better for lower funnel vs which are better for generating overall traffic. This should be used to guide the rest of your social media efforts and identify the sites most important to your bottom line. The Social Conversions Report allows you to measure the success of your social campaigns by breaking them down by network and then aligning them with your on-site goals, conversions and ecommerce transactions. In doing this, marketers can see which networks deliver the highest bottom-line impact, and where they need a social strategy re-haul. Essentially, the Holy Grail of social media success can be found here. You’re welcome. Joking aside, if you’ve ever had to look your boss (or yourself) in the eye and justify why you’re spending time on social media, now you have a report to make your case. Assuming you have one. If you don’t, well, now you know that too. Let’s take a look at Social Conversion report data for Convince & Convert. 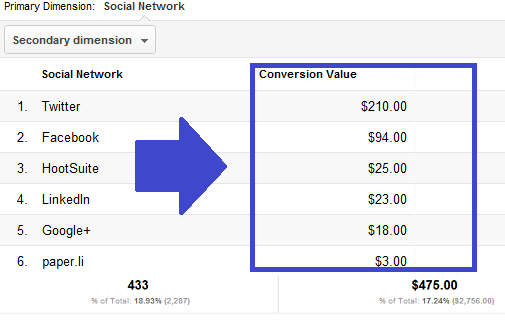 The graph above gives us the number of conversions attributed to social, the bottom-line dollar value, and then breaks it down further (below) to show which networks are bringing in the most conversion value to your Web site. That’s a hard number you can take your CEO when he wants to know why he should keep giving you money to invest into social media. You’re also able to break networks down by Assisted vs. Last Interaction to, again, see which networks are most effective at which stage in your user’s conversion cycle. Marketers should use this report to identify which networks bring the most ROI and to determine what type of campaigns will be most effective on which network. As a marketer, this is my favorite report in the new Social suite because it identifies the networks and communities visitors are using to engage with your content and then lets you see how people interact based on where they came from. As a marketer, a content producer and a lover of social, this report rocks my world by giving me a better sense of where I should be devoting resources. For example, maybe a Fictional Jay Baer woke up this morning and decided he wanted to write off Google+ from his marketing strategy and focus on Twitter. But before he does, he’s going to take a look at his analytics “just to check”. He sees that while Twitter sends more traffic, users only spend ~3:30 minutes on this Convince & Convert post on social media time savers vs. Google+ users who average nearly 7 minutes. By digging further, he notices this is a trend – users from Google+ engage with content for longer periods of time and they’re more likely to dig into other pages on the site. Based on his analytics, Fictional Jay also knows that a visitor who views five or more pages converts at a 30 percent higher rate. Fictional Jay likes how Google+ puts users on a stronger conversion path. Fictional Jay decides not to kill Google+, but realizes the sites can’t be used the same. Twitter is a top-funnel network, while Google+ is a bottom-funnel with more engaged traffic and more conversions. It needs a different strategy. The data inspires informed action. Fictional Jay makes boatloads of new monies. But this report doesn’t stop there. By tapping into Google’s Data Hubs and viewing the Activities Stream tab for Google+, marketers get an interactive look at how their content is being shared on Google’s social network. This allows businesses to quickly identify their top content and find key influencers. For marketers looking to build larger engagement plans or identify brand advocates, this is an extremely powerful way to gain insight into how your content is being shared across Google. You’re able to see who is starting the conversations about your brand, what they’re saying when they share it, and then gain direct access to these people via URL Ripples and URL Trackbacks. For example, maybe I’m Jay and I’m working to create a list of brand advocates that I can reach out to about his book or a webinar coming up. 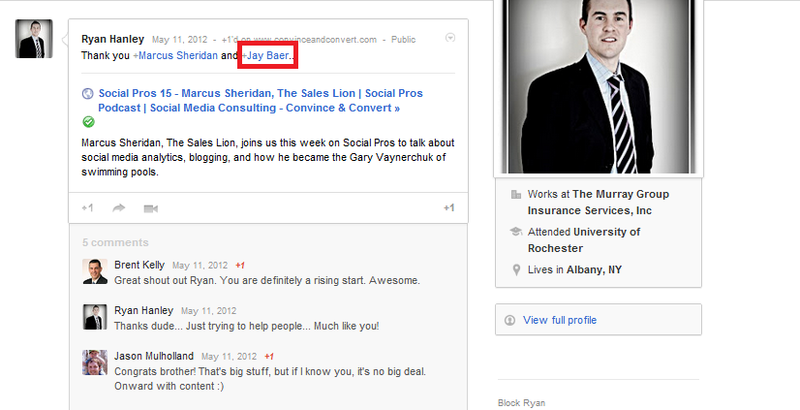 I head into the Activities Stream for Google+ and see everyone who is talking about Jay on Google+. Once I select a post, I can choose to View Activity to see that mention in the wild or View Ripple to see the conversation spread. I choose View Activity and I’m immediately taken to the page where the mention occurred. From here I can interact, I can say hello, and I can use that mention to start a larger conversation. It’s a Google Alert directly in your Analytics. Marketers should use the Social Sources report to understand which networks mean the most to ROI and get an idea of the content that should be created for each. The Activities Stream can also be used to give context to the share so you can see how specific users share your content. Above are some of the ways I believe marketers can benefit from the new Google Social reports. Have you given them a whirl yet?